They are everywhere. Advertisements asking, “Do you have too much stuff?” The solution, the ads say, is to rent a storage unit. 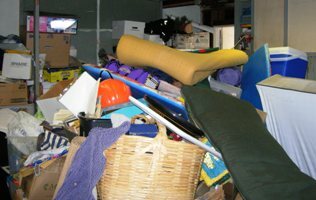 During times like these do you want the extra expense for things that have not been used in months or even years? Empty those storage units and make some money. Plan a garage sale or try selling items online. When pricing remember not to ask retail. If you want something to sell, offer a deal. Do some homework and search eBay for comparable pricing. Not only will you generate cash, but when you free your space you clear your mind. This entry was posted in Clutter Free and tagged clutter free, Deals, Ebay, Freeing Space, Money, Selling on October 11, 2011 by Chris McKenry.